This chapter offers a (traditional) theory of “theory.” It argues that, in seeking to overcome the situation of the modern subject and its imperial aims, it actually articulated their fulfillment—but on a plane of virtuality sustained by new technologies of representation as they converge with developing biotechnologies. Put starkly, if somewhat speculatively: if the project of progress aimed to replace the divine Maker by remaking (hence, owning) what nature provided, how much more complete will that replacement be if accomplished by cloned and genetically engineered (human?) beings living online in digitized virtual worlds of their own design? Regardless of the yet-to-be-determined practical limitations on this prospect—the logic of the historical argument, going back to Descartes sixth discourse, seems undeniable. 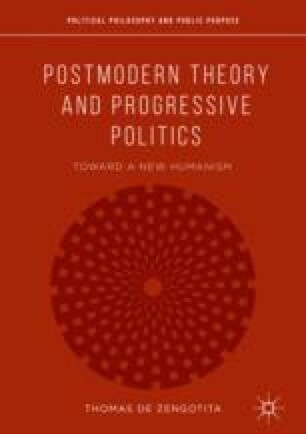 And postmodern theory did not arise accidently in the context of these new technologies and the social and political developments they have engendered. In accordance with Hegel’s little aphorism on the title page (“philosophy is an age grasped in thought”), postmodern theory arose because it reflects and inflects those developments—thereby giving us as conscious agents some leverage, however slight, on the situation into which we have all been thrown.